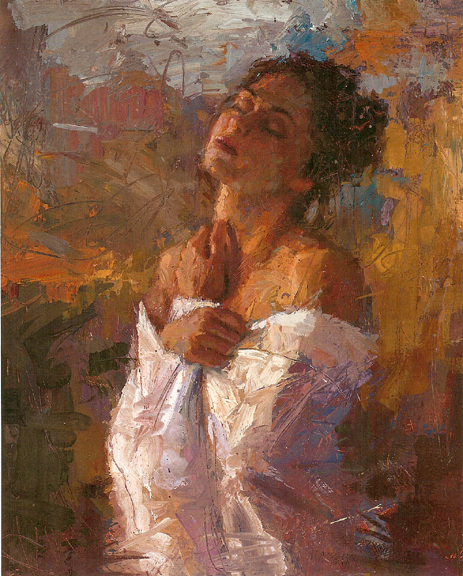 "Bliss" is a unique departure from Asencio's more ambiguous, figurative abtractions, as here he chooses to paint with more clarity and focus. Powerful in its complex simpicity, the artist is captivated by the momentary state of nirvana experienced by his muse. Head back, embraced in her own arms and cloaked in pure white, she takes a deep breath and becomes the personification of complete surrender, peace and spiritual joy. Perhaps in the excution of this work Asencio, too, has found his "Bliss"